There are plenty of interesting pastimes for one to join in some more ‘natural’ that others, however not all hold a strong appeal for me, especially mid-winter. All the while, peering over our collective shoulders, the magnificent Mt Wellington invited us up for a drive. It was more challenge than invitation for Charles Darwin who, in 1830, had to have a second go to make it to the top, although he seemed pleased enough with the view from 4,000 feet up. The narrow but adequate road built 100 years later does the job for us and thousands of others every year. The maximum wind gust registered up here is 174 kilometres per hour, but today’s maximum is a mere 120 kph, although fortunately somewhat more subdued for our short spell on the top. Just the same, even a more moderate 100 kph (60 mph) wind gets your attention. Not that climbing a mountain is the only way to pass an hour or two, a lunch cruise will do that just as well. 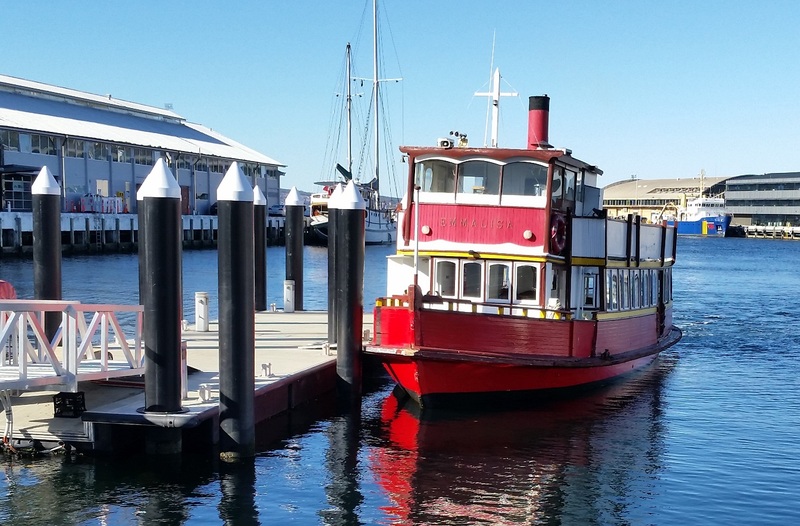 We took a gentle stroll along the city centre wharves to join the good ship Emmalisa that was to take us around the estuary and provide some sustenance in the process. Our little adventure included a close up of the imposing Tasman Bridge, infamously hammered by a bulk carrier in 1975. The Lake Illawarra was coming into port one dark and stormy night (not really but it was a foggy Sunday evening and little traffic) with a stiff tide running from behind. For reasons unknown, the captain tried to pass under one of the main channel’s adjoining spans and would have be able to do so too, if not for two small additional mistakes. The master made the decision to reduce speed so she was barely going faster than the tide, which made her hard to steer. 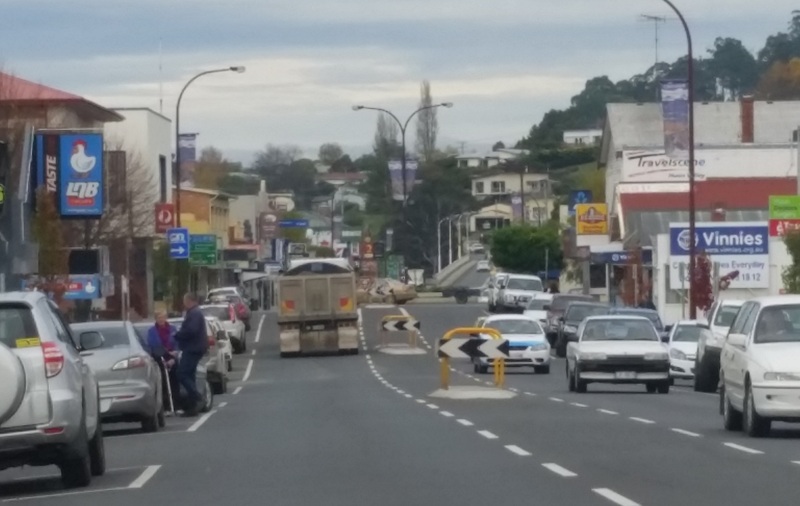 He then made it worse by putting her into reverse so all steering was lost. The gathering night tide smashed her great bulk into pylons 18 and 19, bringing down three sections of the road way. Five people occupied four cars which drove on through the fog into the gap and two fortunate drivers stopped with their front wheels over the edge balancing on the under side. Curiously for outsiders, the loss of the bridge had a host of negative impacts on the residents on the eastern side in particular. Hospitals, cultural activities and government infrastructure were all situated on the western bank. Isolation, long hours of driving or queuing for ferries caused dramatic rises in domestic disputes, suicides and petty crime on the eastern bank. The debris trapped seven crew and sank the ship. She is still down there 40 years later making it impossible to replace pylon 19. This gives a slightly unbalanced appearance from a distance but was the most practical solution given the herculean effort required to remove the wreck of the bulk carrier. Three years later, upon installing the new wider span over missing pylon 19, in addition to very sensibly mandating tugs and ships’ pilots, the authorities also put in place a protocol, forbidding traffic to pass over the undamaged main channel section when a ship is passing under. It is the only bridge in the world with such an ‘over-the-top’ if you’ll pardon the pun, reactive regulation, but the locals are used to it. Several times a day, thousands of cars stop on the bridge at the traffic lights either side of the main channel’s span (many of them on the replacement spans further along) and patiently (well maybe not patiently) wait for the ship to pass under. 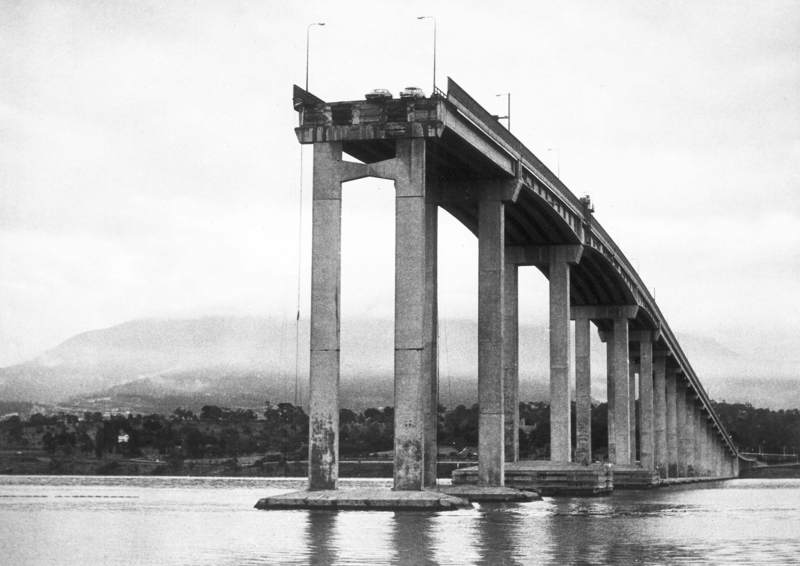 For all the brilliant photo opportunities and interesting sights of Tasmania’s State capital, not to mention the grandeur of the Tasman Bridge, it’s the humble ‘last bridge’ that so persistently tugs my sleeve. While everyone else fronted up for work on Monday morning, we donned our overcoats, scarves and beanies to hit the beach with our boss Winnie, who naturally wanted to chase the ball and burn up a little excess energy. Mid-morning, duty done and chores attended to, we set our sights on Huonville, 35 kilometres to the south west, this time by the more direct route. 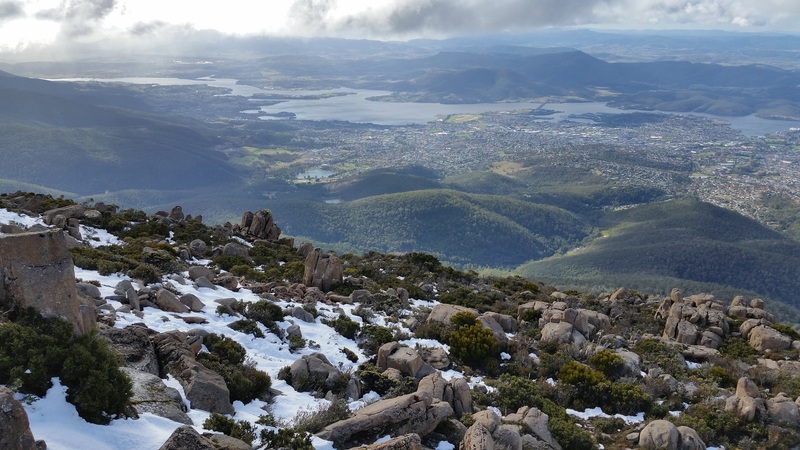 With its 1750 residents, the town sits astride the Huon River and although not a city, neatly covers both sides with modest country homes and small businesses, the centre always bustling with activity. 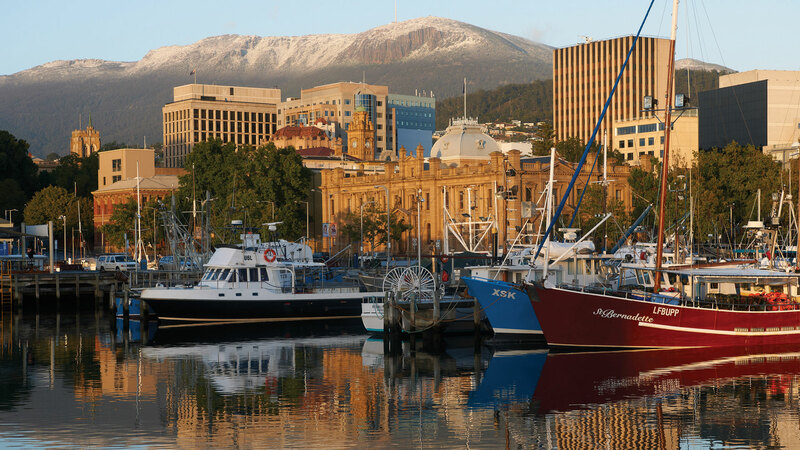 It has an atmosphere of ‘village’ about it, a friendliness and familiarity easily recognized in many small towns in Tasmania and elsewhere too of course. A mere seven kilometres downstream lies the wonderful village of Franklin, home to the Wooden Boat building enterprise famed throughout Australia. It is one of those perfect settings, old riverside buildings with real history, the beauty of the river and the postcard perfect village itself. We’re on a mission so we can’t linger, although every inch of this area is an entreaty to stay on, to breathe in the stillness and the beauty of the river. The modest two lane ‘highway’ lies along much of the 174 kilometres of this short beautiful river, mostly, but never straying far, tantalizing and seducing with quiet bays that hide even quieter safe anchorages for fishing boats and yachts. 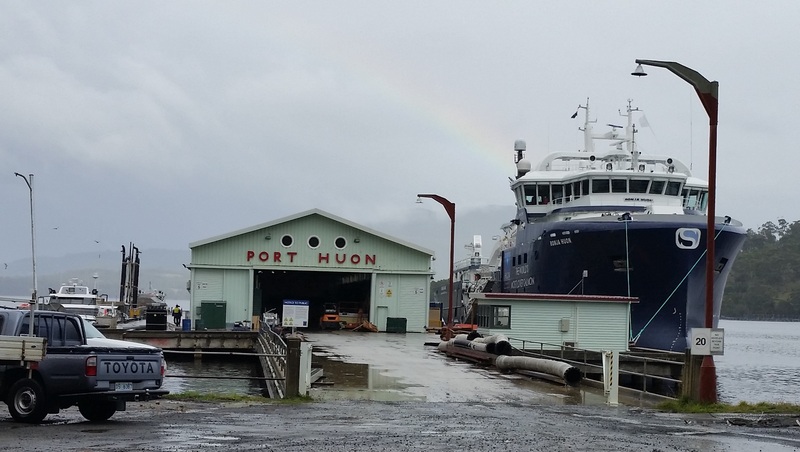 Port Huon, about 12 kilometres from the river mouth, can and does host substantial ocean going ships, in the past ‘glory days of the Apple Isle’ transporting apples to the world and latterly supporting the very successful Atlantic salmon farms further downstream. Here we leave the river for a just a few kilometres until we reach a turn off at Surges Bay, where you have the option of continuing on the highway directly to the fishing village of Dover or following the sinuous road along the river bank. 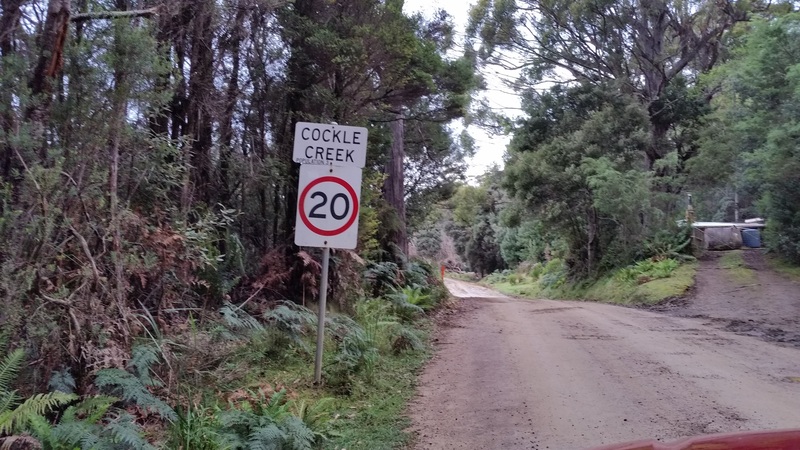 This alternative route hugs the coast very closely, down to Surveyors Bay, another of those unfortunate places where the residents have lost their apostrophe. In exchange however, the fortunate few who have homes here, enjoy a beach-side existence that defies my inept attempts to describe it. 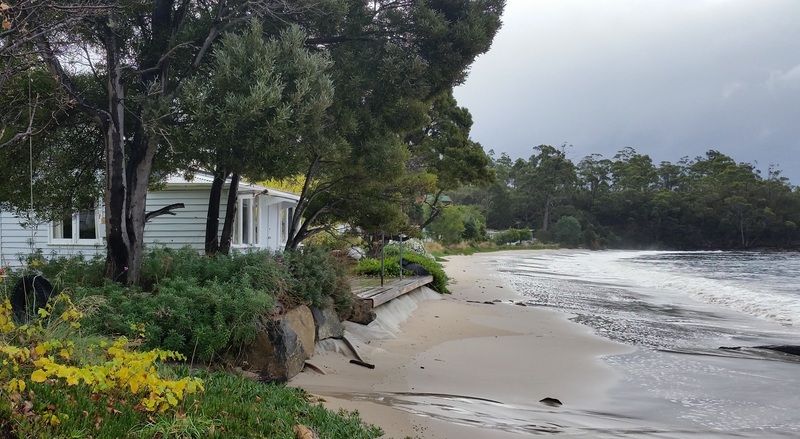 This is home to a stunning sandy beach with gentle waves and residents who can gaze across the river mouth to the western shore, to the villages of Charlotte Cove and Verona Sands. Standing on this beach, one even contemplates the unthinkable; it may be perfect. From here it is but a short drive to Dover on Port Esperance, just below the wide mouth where the river meets the Great Southern Ocean, protected by the mountains of the Bruny Island National Park stretching more than 20 kilometres, a buttress to the wild seas beyond. Dover is another on a long list of enticing villages where one again thinks about living in a paradise, albeit a cold one in the watery sunshine of the southern hemisphere’s early winter May . Now we leave the river for a while to cut across the mountains a bare eighteen kilometres to Southport and the end of the bitumen where stands the most southern, if otherwise unremarkable, hotel in Australia. This hotel is so remote, even Google can’t find it. Perhaps only New Zealand and Argentina have more southerly hospitality, but even now, overlooking the bay we are protected from the southern ocean by the sweep of coast line and the comforting arm of Bruny Island. One will not be troubled by indecision about which attraction to view first, or last for that matter. Once you’ve seen the pub, the jetty and the scattered houses, there is not a lot left to do but retrace the bitumen a kilometre or so to the beginning of the dirt track that leads further south and finally, to the last bridge in Australia. We have just twenty kilometres of well-maintained dirt road in front of us before we see the water again but the rainforest is a welcome experience of sight and smell, as the damp quietness envelopes us at any stop along the way. There is no temptation to move along too quickly and the towering trees and dense bush gives an unmistakable sense of unspoiled, primeval wilderness. I feel a slight quickening of the pulse reliving the memory of the excitement of discovery and adventure. We regain our connection to the water in the protected calm seas of the most appropriately named Recherche Bay. (Recherche: French; rare, exotic, exquisite.) The following extract (spelling errors included) is from the French expedition in 1793. To my amazement, that perfectly describes how it affected me. It will be difficult to describe my feelings at the sight of this solitary harbour situateted at the extremeties of the globe, so perfectly enclosed that one feels separated from the rest of the universe. Everything is influenced by the wilderness of the rugged landscape. With each step, one encounters the beauties of unspoilt nature, with signs of decrepitude, trees reaching a very great height, and of corresponding diameter, are devoid of branches along the trunk, but crowned with an everlasting green foliage. Some of these trees seem as ancient as the world, and are so tightly interlaced that they are impenetrable. The water is incredibly clear, the air is the purest in the world and the stillness is physical. As with most of the Tasmanian island, there are few ostentatious birds here, but a call from the secretive inhabitants of the rainforest, breaks the silence occasionally. We have just five kilometres to go but we are most reluctant now to move on, for this to end. The road is almost on the beach with tiny shacks of a certain age, dotted along in twos and threes, their well-worn facades telling of their being host to countless summer holidays and more. Finally, reluctantly, we come to the last bridge, regretting that we have come too late to see it’s weather beaten and no doubt romantic ancestor, for here in this beautiful wilderness, lies a brand new concrete structure as common as dirt. There is little disappointment to feel, for it’s not the bridge that we’ve come to see, it’s the existence of the bridge, its unique status that is the inspiration for this journey, the desire to see where the roads ends, an ancient urge that still resides in most of us. 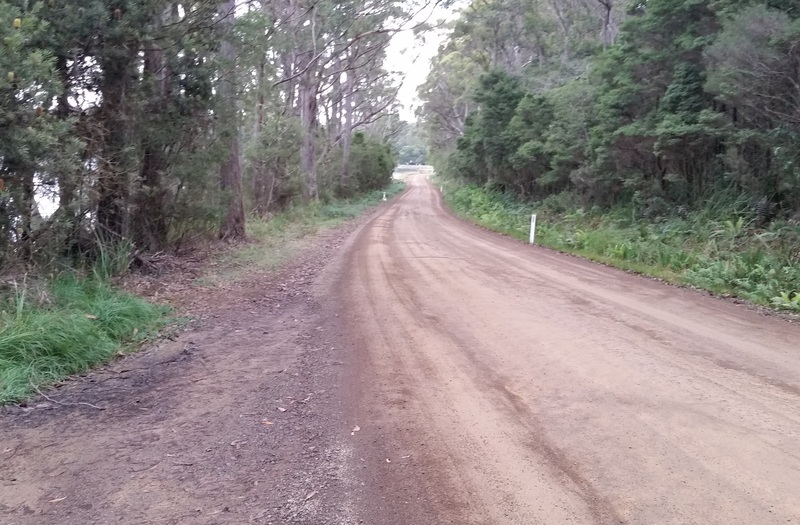 After cruising through the town of Cockle Creek (population 3) and crossing the crystal clear waters of Cockle Creek (the creek) the road peters out to become a short sandy track providing access to half a dozen free camp sites just behind the low scrub that defines the long sandy beach. 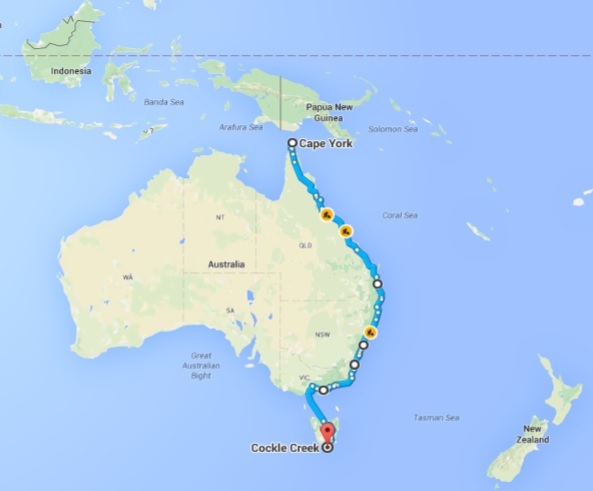 It seems fitting somehow, that the most southerly road in this vast continent should just melt into the bush. There is no crass commercialization of this important point in our landscape, no proliferation of signs prohibiting everything, no parking lots for five-minute tourists, no hawkers, no shops or souvenirs. 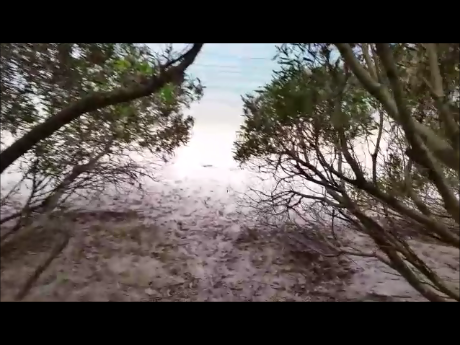 Nothing but the beach, the creek, the bush and the stillness. 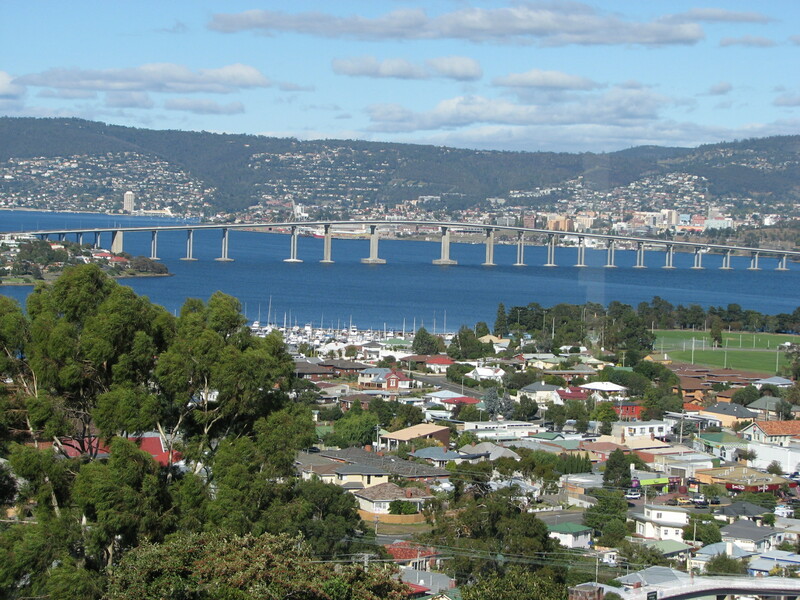 Just to be here, to cross the last bridge in Australia, is enough. One of your best yet! Especially as we remember taking our big yacht right up the Franklin and seeing the things you described..
Agree with an earlier post. Best one yet. Picky poiny coming up : mixing miles and kilometres ie “60 mile an hour wind” on Mount Wellington. While it does chafe a little, it’s my one small concession to those in that ‘other’ well-known country that still works in the old imperial system of measurement. Don’t want to be criticized for mimicking their common faux pas of assuming the audience is forever restricted to my small patch. Perhaps I should have made it clear it was a translation. On second thought, I will edit as it does indeed look a little clumsy.